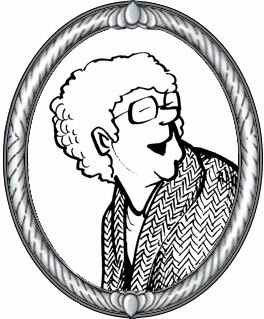 About Thelma: An elderly neighbour whom Elly often visits. Mrs. Baird raises Old English Sheepdogs - one of which, Farley, has become a member of the Patterson family. Show or Hide Thelma's Life Story! "Come on, Lightning. Get up." Thelma Clifford leant impatiently over the neck of her woefully misnamed pony and drummed her heels against his fat sides. The gelding rolled a reproving eye back at her and, with a heavy sigh, broke into a choppy canter. Beside him, Kip barked approval. The big sheepdog made a playful feint at nipping the pony's heels before shooting off ahead of them onto the long slope of the meadow, ignoring the wary stares of the brindled Shorthorns grazing there. As she rode, Thelma drew in deep draughts of the sweet, wild-scented air. Even though she had lived in the Yorkshire Dales the whole twenty years of her life, she never tired of its austere beauty, its windswept hills and fertile valleys. "A pokey old hole, with not a bit of fun anywhere. How you can stand it!" Her sister Pansy had left the aging comfort of their family's stone farmhouse without a backward look the moment she turned sixteen, and gone off to the city to find herself a job and a husband "who won't stink of the barn when he gives me a cuddle." Kip gave a sudden sharp bark as they approached the river which meandered through the meadow. Alerted, Thelma narrowed her eyes at the shadows under the hanging willows by the river's edge. It took her a moment to spot him, the man lounging against a tree there, long legs stretched out on the grass. There was a rucksack beside him, and a soft cap pulled down low over his eyes. Kip streaked away down the riverbank toward the intruder. With a groan, Thelma hurried after him. Kip was exuberantly friendly, but he was a big dog and could frighten anyone who didn't know him. She needn't have worried. By the time she arrived, Kip was happily wriggling on his back while the stranger rubbed his tummy with cheerful vigour. "Nice dog." The stranger touched his cap and smiled, showing even white teeth in a lean, tanned face. A young man, this, with bright hazel eyes that studied her with amiable appreciation. "Nice owner, too. I suppose you've come to tell me I'm trespassing?" "Well, yes. You are. But, ah, I just came down because I was afraid that Kip might - um - frighten you." The moment she said it, she knew how daft it must sound. Kip looked about as frightening as a day-old lamb, with his big paws waving in the air and pink tongue lolling. "Aye, he's a dangerous guard dog, your Kip. I can see why you feared for me." The stranger's grin robbed the words of any insult. "He's a beauty, too. Purebred?" There was a distinct burr of Scots in his voice, which unaccountably left Thelma with an itchy warm feeling, as though she wouldn't mind having her own tummy rubbed. "Yes. My family has bred Old English Sheepdogs for years." "And fine ones, too." The stranger gave Kip a last brisk pat. "Well, I'll take myself off, then, now that you've rumbled my trespassing." He rose to his feet, tossed his rucksack over one broad shoulder, and extended a hand up to her. "Nice meeting you, Miss - ." Thelma took his hand. It closed warm and strong over hers. Absurdly, it dismayed her to think of him leaving. "I didn't mean to frighten you off. You're not doing any harm, no need for you to go." "Aye, well, I should be on my way anyway. Unless, of course," the hazel eyes met hers, "your father might happen to have a job of work to be done? It's employment I'm looking for, and little enough of it to be found these days. I thought perhaps in farm country, with the haying underway... ?" "I - you can ask him. He'll be in for his tea soon." It was doubtful that her father needed any extra help, with two strong sons farming with him. But somehow, by the time they rose from the tea table, William Baird had talked himself into a job as hired man with the Cliffords. "Good worker, that Bill." Her father grunted as he stretched his legs to the fire that night. "Doubt if he'll stick here long, though. Got a head full of bright ideas, and ambition enough to maybe even chase one or two to ground." He slanted a look at his daughter. "No point in any of us getting too used to having him around." It didn't take Thelma long to realize the truth of her father's warning. Whenever she and Bill talked, the subject always veered back to the same topic. "Motor power, that's the future." Bill's stride quickened with excitement as they walked through the orchard together. "Farm work, transportation - it'll be all done with motors. I'll wager you that in another ten years, by 1935 at most, it'll be a rare thing to see a horse on the road or in the fields. And I'm going to be part of the change, getting my piece of it." Thelma wasn't sure she liked the idea of the big, placid work horses being replaced with noisy, smoky machines, but there was no curbing Bill's enthusiasm. Within a year, he informed her that he was on his way to Canada, where he had managed to wangle a job working with a new company that made tractors and other mechanized farm machinery. "That's where the future of engine power is, in the New World. They're willing to try new things there, not stay bogged forever in old tried-and-true." Thelma, took a long look around the old farmyard, swallowed the lump in her throat and made her decision. "Well, you're not going without me, William Baird." They were married in her mother's flower garden, with roses and hollyhocks scenting the breeze as they made their vows. It was hard to leave England and all her family, but Bill's enthusiasm for the opportunities awaiting them was infectious. For the next ten years, they hop-scotched around North America, moving from city to city and one machinery company after another while Bill honed his skills as a mechanic and a salesman. At last they settled in the rich farm country of southern Ontario, where Bill set up his own farm machinery dealership. The first years were hard, as the Depression deepened. Sales were slow. Since they could not afford to hire any staff, Thelma worked long hours alongside Bill, doing the bookwork, the inventory, even helping with repairs where she could. It was hard work, and frightening to see how little was left over at the end of each month. Thelma was in her thirties, and hungry to start a family, but "I can't spare you from the business, old girl. Maybe after this harvest, if enough of the farmers can pay their bills..."
It was the sleeping sickness epidemic of 1937 that, cruel as it was, turned things around for them. As horses everywhere sickened and died, farmers replaced them with tractors. Sales boomed, and with it, the repair and service business. The outbreak of war solidified the move from horses to machinery. With hired men in short supply, farmers were eager for mechanical means to replace manual labour. The business expanded, and Bill started another dealership, then another. By 1946, the Bairds had five dealerships and over 25 employees. Thelma continued to help out, no longer from financial necessity, but because she found it depressing to be home alone every day. After so many years of hoping, their chances of ever having a family were fading. It was some compensation when Pansy sent her three children to Canada for safety during the worst of the Blitz, and then, when her husband was killed in the last days of the war, followed them overseas to Bill and Thelma's home. With the house full, and Bill always dreaming up new business ventures and expansions, Thelma had little time to mourn her own childless state. Things improved steadily for the Bairds financially. Bill's restless nature shifted from business expansion to a sudden interest in world events, and travel. They made yearly pilgrimages back to England, explored the whole of the British Isles and large sections of Europe. They even made a daring venture as far as China, where Bill's main comment was shock at how far behind the Far East was in the use of farm machinery. Then, suddenly, Bill's boundless energy began to ebb. Although he never complained, it was clear that he tired easily, and had trouble concentrating. His appetite became erratic, and he lost weight. Thelma took on more and more of his business responsibilities to give him time to rest. With so much else on her shoulders, it was a relief when Pansy re-married and moved to Alberta with her new husband. "Mrs. Baird?" The manager of the branch dealership hurried up to her as she walked through the door for her monthly review of the books in September 1952, his brow furrowed with worry. "Head office called. Your husband collapsed at work. He was taken to the hospital by ambulance an hour ago." Bill had refused all along to admit anything was wrong. But now that he had hit the breaking point, it was complete. The diagnosis of cancer, advanced and inoperable, took all the heart out of him. Unable to work, with the looming prospect of death haunting him, he gave up all interest in life and did little but shuffle from bed to sofa to stare out the window. It was left to Thelma to handle the tough task of selling the dealerships and winding up their business ventures. By the time things were settled, she was shocked at how much Bill had aged, and the frightening lassitude that seemed to have taken permanent hold of him. With the hope that a change of scenery might re-awaken Bill's interest in life, she sold their home and moved them to a charming new house with a spacious yard and a view over Sharon Park in the quiet town of Milborough. The move helped, a little. Bill revived enough to help her transform the weed-strewn back yard of the new house into a miniature English garden, complete with a lovely bed of old-fashioned roses. When winter came and his lethargy returned, Thelma decided in desperation to try introducing another taste of the Old Country to spur his interest. For Christmas, she gave him a pure-bred female Old English Sheepdog puppy. Dahlia, as he named the pup, became Bill's last great love and solace. As long as he was able, he walked the dog daily, taking her for long, slow rambles through the nearby park. Even when he became wheelchair-bound, he would throw her ball and laugh at her rollicking antics as she retrieved it. The day he died, Dahlia was beside his bed, whimpering her anxiety as her master slipped away. With Bill gone, Thelma found herself at loose ends for the first time in her life. No one needed her; nothing urgent remained to be done. Realizing the danger of depression, she decided to focus on her last remaining link with Bill - Dahlia. The dog was pure-bred and of show stock, and Thelma's family had bred Old English Sheepdogs for years back in England. Thelma bought a full grooming kit and rulebook for the Canadian and American Kennel Clubs, and took Dahlia onto the show circuit. It soon became an engrossing hobby. Thelma not only attended all the major shows in North America, but she also worked on a number of committees, served a term as Secretary of the Canadian Kennel Club, and became a judge for Working Breed dogs. She also occasionally bred Dahlia and her successors to champion studs and sold the pups into carefully selected homes. Many of the families kept in touch with her over the years, providing her with a sort of extended family. With the dogs, her volunteer work, and the pleasure of cultivating her prize English roses, Thelma found herself busy and content. After Petunia's premature death in 1974 from a virus picked up at a dog show, Thelma decided to give up showing. She was over 70 anyway, and ready for a less hectic life. But she found it lonely without the company of a dog after so many years with her shaggy companions. When a worried young woman phoned her to say that, because of allergies in the family, they could no longer keep the pup they had bought from Petunia's last litter, Thelma was quick to agree to buy Lily back. As more houses were built along Sharon Park, Thelma had always gotten along well with her neighbours, but in a casual, over-the-fence kind of way. When the Pattersons moved in next door in 1980, she expected to have the same cordial, slightly distant relationship with them. Until, a week or so after their arrival, she caught four-year-old Michael in her garden with one of her prize roses tattered and torn in his small, grubby hand. "'Cause Mommy's sick today," he explained tearfully when she confronted him, "and your flowers are so pretty, I thought one would make her feel better." His big-eyed, woeful expression was too much for Thelma. She promptly went for her garden shears and helped an astonished and delighted Michael cut a lavish bouquet of roses, asters and daisies for his mother. She helped deliver it, too. This was too good an opportunity to miss, to meet her new neighbours. As it turned out, Elly Patterson was suffering from morning sickness, to which was now added embarrassment at her son's misbehaviour. Thelma reassured her, and over a cup of tea, listened as Elly poured out all her worries about mortgages, children and the stresses of moving into a new house with a husband who was working overtime to pay for it and rarely around to help. Thelma was thrilled. Someone needed her again! She promptly offered to take Michael to the nearby park for the afternoon to let Elly suffer in peace, and promised cuttings and roots from her own garden to help bring the Patterson yard into bloom. It was the beginning of a warm and lasting friendship between the two houses. When Elly and John rushed off to the hospital at 3 a.m. for their new baby's birth, it was Thelma who dragged on a housecoat and came over to their house to babysit the sleeping Michael. When word came of the sudden death of Thelma's older brother, it was Elly who comforted her and helped make the arrangements for her flight to England. Both Michael and baby Elizabeth adopted her instantly and unquestioningly as an extra grandma. They often showed on her doorstep unannounced to visit, share all the interesting news of their young lives, and check out the contents of the crystal dish of English toffees and cream candies she always kept on the coffee table. When a breeder she respected begged Thelma to breed Lily and allow him to choose the pick of the litter, she couldn't resist. It was a pleasure to connect again with some of the people she had liked in her dog showing days. More importantly, she thought it was past time that the Pattersons had a dog. Remembering her own early years, she believed firmly that there was nothing better than a dog to teach children responsibility and the wonder of unquestioning love. With a litter of cute, furry puppies to aid her, she had a shrewd notion that she could make John and Elly see things her way. Thelma knows she'd done the right thing when she sees how much pleasure little Farley, the puppy, gives the Patterson children. And even Elly, although she grumbles about shedding hair and dirty paws, obviously loves the new family member. Farley's littermates have all found good homes as well. Thelma enjoyed meeting the prospective buyers and seeing their delight in their new pets. She even promised to help one young family show the promising show-quality female they chose, Dame Clarissa of Mountjoy (alias Crumpet), once the dog is old enough. The secret to a happy retirement, she likes to tell friends, is to stay close-linked to young and growing things. With the dogs, her prize roses, and her "adopted" grandchildren Lizzie and Michael to enliven her days, Thelma considers her life very happy indeed.